When talking about knife blades types, we are talking about the design of the blade, or the shape. Different knife blade types are conducive to their ideal uses. There are many available today and often knife makers will make an altered version to trick up the standard knife blade types. For simplicity sake I’ll discuss the most popular blade types on the market today, and describe some of their best uses. Let’s get to it. Simplest category is a straight back, or normal blade with the rounded edge and straight back. Such kinds of blades are mostly used for cutting and chopping purposes. The wider back of the blade doesn’t have a sharp edge so additional force can be applied with you hand or finger to make cutting easier. Since the back doesn’t have an edge it can be made thicker, giving the blade more strength and the additional weight can make chopping a simple task. In a clip point blade, the back is clipped, or removed towards the tip of the blade to give it a sharper and thinner tip. The clip point is designed to get into those tight, hard to reach places and allows for a more precise cut. The cut out, or clipped area of the blade can be straight or slightly curved. Clip point blades are ideal for everyday use, however with the thinner tip this blade type can be significantly weaker, than say a drop point. Drop point is a knife blade that slopes on the spine of the blade to eventually meet the sharpened edge of the blade, giving it a “V” shaped blade. Unlike a clip point which uses a concave curve, the curve on top of a drop point is always convex. The drop point is a suitable design for hunting knives, particularly when skinning an animal the design of the drop point is careful not to puncture its internal organs. However, you will find that many knives employ drop point blades because they are also suitable for everyday uses. A trialing-point blade has a back edge that curves upward to end above the spine. This allows a lightweight knife to have a larger curve on its edge and provide a larger cutting surface. This design is optimized for slicing or slashing and is common on skinning knives and filet knives. A spear point blade is symmetrically shaped with the point aligned with the center point of the blades axis. True spear point blades are doubled edged with a center spine, like a dagger or spear head. 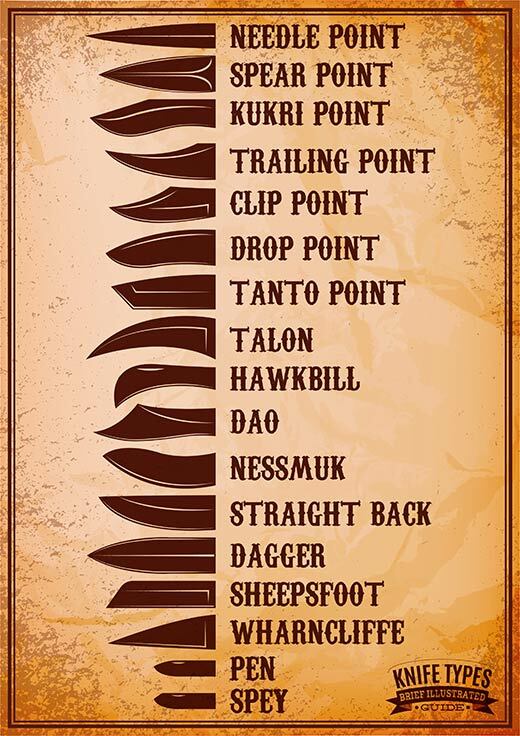 The spear point is one the strongest blades in terms of penetration stress, and is found on many thrusting knives, such as the dagger. Often single edged knives without a central spine are confused with the spear point, such as a pen knife. A sheepsfoot blade carries a straight edge and a straight dull back that will curve towards the edge right at the end. It provides great control, because of the dull back edge is able to be held by fingers. The sheepsfoot blade was originally made to trim the hooves of sheep, their shape bears no similarity to the foot of a sheep. Now there are of course many more knife blade types, I’ve described some of the more popular knife blade types in this article. Wikipedia has some great information on the more obscure knife blade types.